Bir KULLANILAN arıyorsunuz KC300A ? Centerless grinder with slanted bed for high precision grinding of large diameter parts. 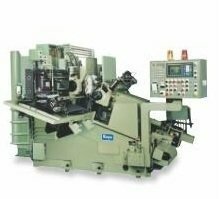 Koyo produces various grinding machines, assemblies, spindles, precision ball screws, handle and universal joints, and drive shafts for industry. Additionally, Koyo performs applied engineering research and production engineering research. 58 ModelHakkında daha fazla vew Koyo Machine Industries Co., Ltd.
Yeni satın almak isteyen KOYO KC300A ?